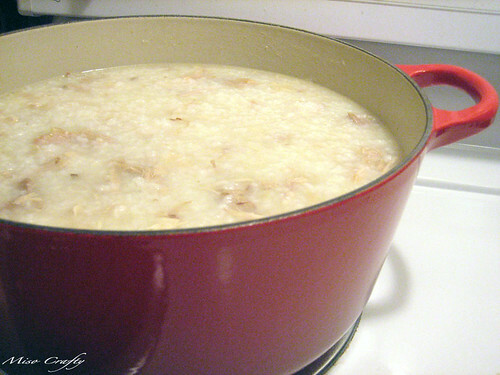 My first ever attempt at making jook (a.k.a: congee...a.k.a: Chinese porridge). I made this huge batch Wednesday from the bones and leftovers of the Thanksgiving turkey. I didn't mean to make so much, it just happened. After this was made, I swear I had like, 5 bowls. I have great memories of my daddy making this after every Thanksgiving and Christmas dinner, every single year growing up. So having a bowl of this, which tastes exactly like my daddy's (minus the shiitake mushrooms, which I didn't have on hand), brings me back and makes me think of my childhood. Brett had a little bit, but only after I warned him that the average non-Asian person would find this tasteless and boring. It is, after all, just rice with a ton of water and some meat thrown in (really, it is!). He thinks tasteless is an understatement. I then told him it was the Asian equivalent to chicken noodle soup. Anyways, he didn't like it, so it's all mine! I'll be eating this for a week...anyone else have weird food/childhood related things like this? Jook is totally the chicken noodle soup equivalent! I would always make a batch (or ask my Sister to make me a batch) when I'm sick. It's so warm and soothing! It doesn't take much rice either. You could always season it with a bit of sesame oil and I love fresh slices of ginger in it. Or, do you like it with Century Egg? Jon has not (and probably will not) develop a taste for that one!